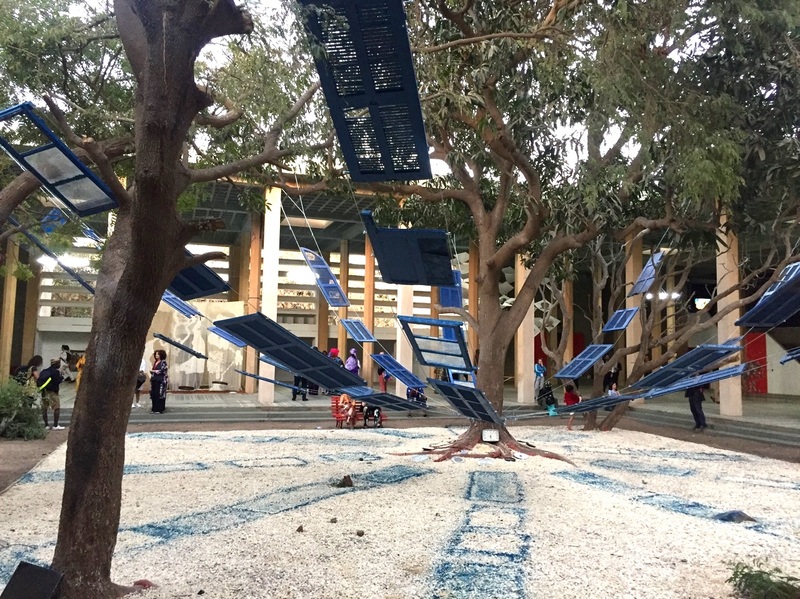 The 13th edition of the Dak’Art Biennial explores the contingencies of exhibition-as-novel, the curatorial approach taken by its Artistic Director Simon Njami. Known as one of the luminaries of the contemporary African arts and the founder of Revue Noir, Njami often positions himself as a writer, aspiring to emphasize a narrative thread and literary rhythm of the exhibitions he undertakes. His work might be perceived as a curatorial provocation, creating illusions, and plotting new tensions. This approach corresponds well with the heritage of Dak’Art that was launched in 1990 as The Dakar Biennial of Arts and Letters. Njami’s literary approach to curating takes a point of departure from fixed propositions rooted in the post-colonial, with all its intellectual baggage. 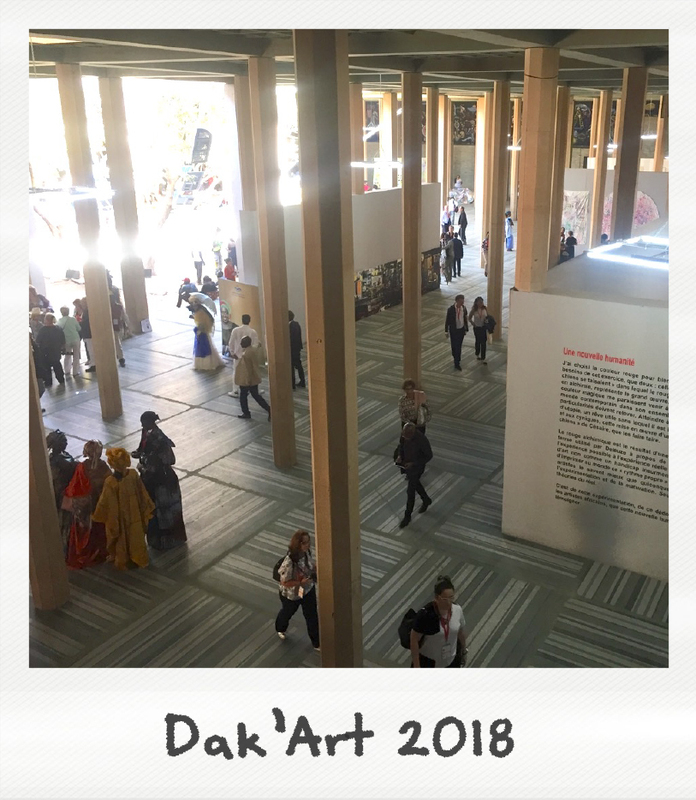 The main Dak’Art 2018 exhibitions showcase both predictable and unusual choices for the curatorial griot singing praises of the pan-African project of art promotion. The premise is arguably to demonstrate that today “the notion of Africanity is totally blurred,” as Njami remarked in his interview with the Biennial Foundation. The curatorial framework is constructed around L’Heure Rouge (The Red Hour), a concept borrowed from a 1960s play by Aimé Cèsaire, a Martinican writer, poet, and politician and one of the forefathers of the Negritude movement. Njami reads Cèsaire’s story as emblematic of an alchemical contact zone of creativity, and invites the audience to embrace the vision of “A New Humanity” as an artistic response to the aesthetic encoding of passion, blood, primary pigment, and desire. At the main venue of the Ancien Palais de Justice one is first drawn into the courtyard. Pascale Monnin’s Elevation swings with window shutters salvaged from the 2016 hurricane that ripped through Haiti. Arlene Wandera’s On the Ladder calls the passerby with its kinesthetic suspension. In the distant rafters, Nathalie Mba Bikoro’s Triumph of Seagulls sways in commemoration for women’s strength, critically countering the patriarchal blind spots of the Red Hour. For Bikoro, Cèsaire and other pan-African liberation thinkers are still celebrated without any admission of their overt misogyny. The Ancien Palais de Justice is not a traditional exhibition space, making it rather difficult to create a linear narrative parcours. On the other hand, this monument to anachronistic bureaucracy is a perfect backdrop for the polyphony of artists’ articulations of decolonization featured in the show. One can wander in the backyard to find Marcos Lora Read’s La Casa Roja de Coronte. Dramatically waving from the Atlantic Ocean gusts, the piece evokes anxiety of displacement and fragility. Next to it, Ibrahim Ahmed’s Only Dreamers Leave consists of 30 sails of quilted fabric imbued with the task of yoking colonial heritage into the present. The old court houses provide grand rooms where the architectural ruins enter in conversation with fatalist works such as Paul Onditi’s Calm in the Storm or Glenda Leon’s Temps Perdu II that remind us of the present state of urgency. The latter consists of a small hourglass, perched on top of a nearly two-meter-tall cone of sand. The many films on display take us into even darker places – literally and metaphorically – such as Christian Nyampeta’s film Life After Life, which tells a story of being buried in the wrong tomb. Yet, many of them seem to have a resurrecting component as well, pushing the viewer to transcend the panic, crisis, or discomfort. Kudzanai Chiurai’s We Live In Silence is perhaps the best example of such encouragement – through sheer beauty the viewer sits, transfixed, until the pain subsides and the ruler rises. For all the layers of thought and the seriousness of decolonization exercises, some artists took a more playful approach. Moshekwa Langa’s KAM and Emo De Medeiros’s )U( try to invert the subjectivities and play with objectification in the physical and metaphysical senses. De Medeiros’s immersive space does not allow the viewer to escape; rather one is drawn deeper and deeper into the need to question positionality. Moving between old offices, courtrooms and the open inner courtyard creates space to appreciate intimate works and be wowed by grand sculptural impositions. The artistic direction of Simon Njami is complemented by the efforts of five international curators invited to conceive their respective sections of the Dak’Art 2018 “IN” show: Alya Sebti – the director of the IFA Gallery in Berlin, Bonaventure Soh Bejeng Ndikung – Artistic Director of the art center SAVVY Contemporary Berlin, author Marisol Rodriguez, Cosmin Costinas – Executive Director of Para Site in Hong Kong, and, Marianne Hultman – Artistic Director of Oslo Kunstforening. The complementarity of these micro-exhibitions is readily apparent for some, and less for the others. For example, Ndikung’s show The Canine Wisdom for the Barking Dog – The Dog Done Gone Deaf, a homage to a musical and artistic legend Halim El-Dabh, at first does not resonate with the rest of the “IN”. The omnipresent headphones, walls covered with long texts and artistic reflections cannot be easily associated with Njami’s overall vision. It is only through Ndikung’s presentation during the opening conference that the links are made and the brilliance of Halim El-Dabh realized for a revisit to the show. The IFAN Museum of African Arts, hosts Invisible and Long Green Lizards curated by Alya Sebti and Cosmin Costinas respectively. The two exhibitions offer its visitors with a plethora of visual and audible experiences to appreciate. Stand out works include Zihan El Tahri’s multimedia portrait Family Function or Hamedine Kane’s provocative Salesman of Revolt that blends prints and video to propose a performative inversion of black consciousness and progress. Similarly Younes Baba Ali’s Daily Wrestling immerses the viewer in the battleground with life’s materiality, rooted in the Senegalese tradition. These video and installation works collide the realm of art with the experience of everyday life. 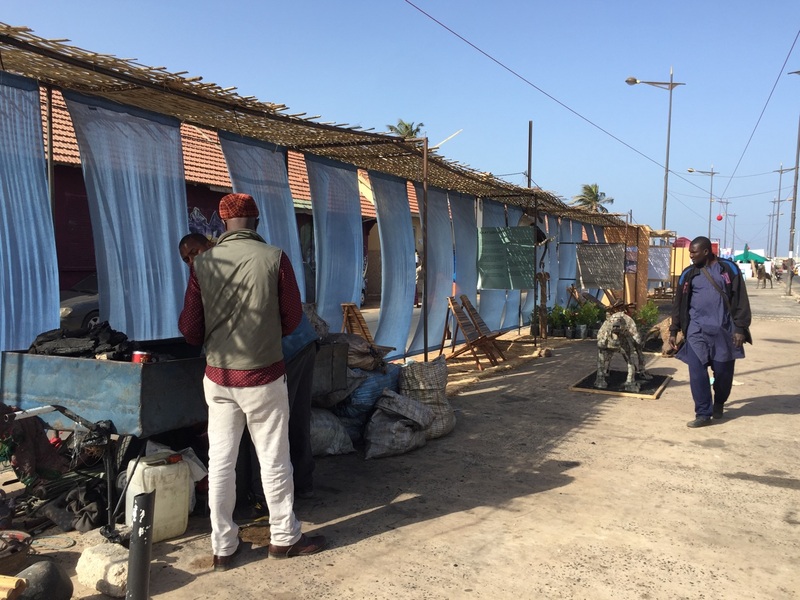 This theme continues in Mon Super Kilometre, an exhibition project set in an outdoor market with installations situated along the canal. The works weave in and out of market stalls, threaded by blue backdrops signifying the intervention. 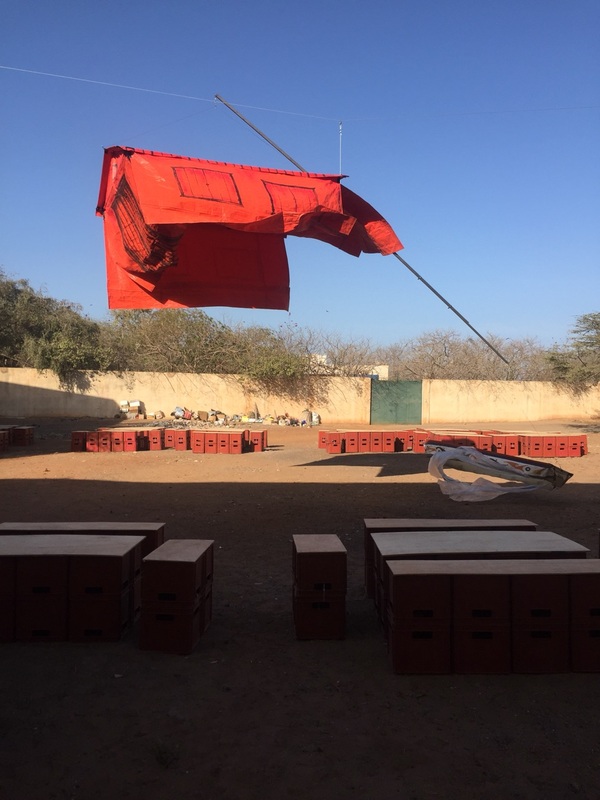 This movement throughout the space leads to key Dakar’s independent art spaces like Raw Material Company and Ker Thiossane. Integrating contemporary art and the city in this way breaks out of the containment of closed walls, text, and didactic engagement. 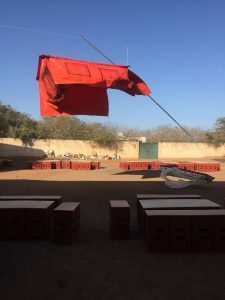 For these seeking clean, contained, and conceptual work, the show at the Maison des Anciens Combattants offers a perfect break from the busy streets of the Senegalese capital. Darb 1718 is a succinct presentation of works from Egypt, which stakes an important claim in African art that is usually confined to sub-Saharan or so-called ‘black diaspora’. At the Maison, the works by artists such as Noha Nagi or Hanafi Mahmoud reflect the spirit of the Egyptian “bred riots” of the 1977. Despite some organizational pitfalls – including delayed openings, few unplugged video works and frustration among some of the participating artists – the Dak’Art 2018 “IN” exhibitions and programming fulfill Njami’s promise of, “openness, subjectivity, discovery, and experimentation.” Nonetheless the tension between the curatorial vision and the governmental aspirations is palpable. As Njami told Biennial Foundation, he has learned to transcend some of these tensions while working on Dak’art in the past (notably in 2016). His continuous commitment to African Biennials will be tested again later this year, when he will curate the 3rd edition of Kampala Art Biennale entitled The Studio in late August. Kara Blackmore is a curator and writer who works at the intersection of arts, heritage and social justice. To reflect on more than a decade of practice she is undertaking a PhD at the London School of Economics.